Looking at this photo - I bet you think I got my weeks mixed up - this is Y for yellow, not X. But that is precisely what this post is all about. 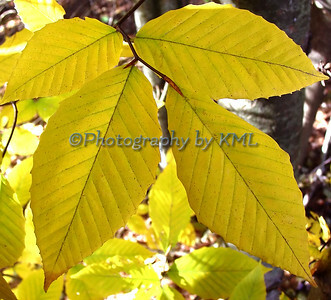 The substance that makes that gorgeous yellow color in the autumn leaves is called xanthophyll. And there is plenty of it in this autumn leaf. No trickery this week, my friends, but I must say, finding these words for these letters is getting tricky! Another Holiday season has arrived, and I am sending holiday greetings to all my friends. Hope this time is a special one filled with love and joy. 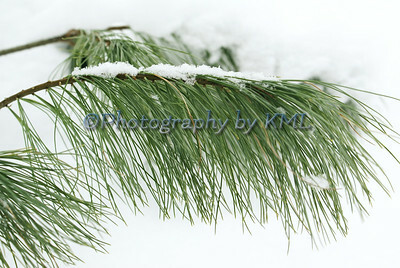 Be safe in your travels and enjoy this beautiful time of the year! 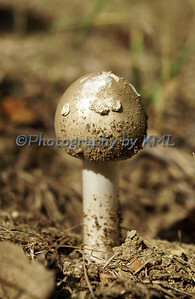 I found this white mushroom at the lake this past fall. We had been going there every day, and this guy just appeared overnight. There were quite a few that had grown in that short time around the sandy area. Within three days time, they had turned all black and were beginning to deteriorate. Such a quick lifetime for them - glad I had my camera that first day! In my last post I showed the view from the end of the pier. 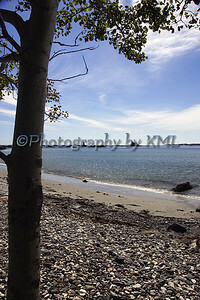 This is the view of the pier from under a lone tree on the edge of the shore. 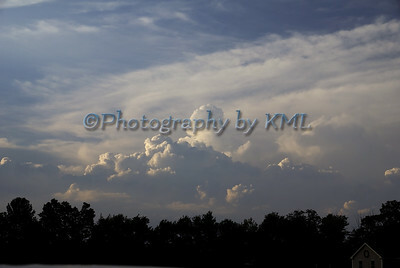 We were there on a gorgeous fall day, I can just imagine what this view is like when there is a storm. The water must crash over the top - what a sight it must be! We had seen this long pier from across the harbor on the other side of the river. You could tell it was long, but in the distance it looked really small. 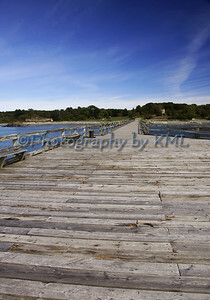 We were on the New Hampshire side when we first saw it, and the actual pier was on the Maine side of the harbor. The next time we visited the ocean, that pier was where we headed. It was gorgeous fall day and we found it was part of a fort in a big park. We walked over 5 miles that day - and it was worth every step! This photo was taken at the very end of the dock, looking back towards the land. 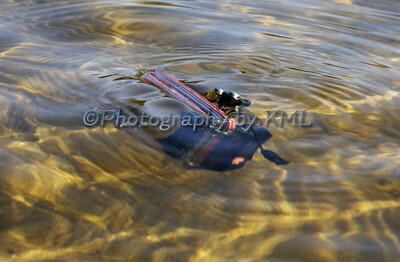 In my last post, I showed a point and shoot camera in a case under the water. It was pretty hard to tell what it actually was in the photo, so here is what it looks like out of the water. It's just a little tiny one - an older one that I picked up online. The plastic case is perfectly designed just for it, and it is quite water tight - I tested it out in the sink before I put the camera in it. The brand has been removed so I can use this photo as a stock image. It is a Canon and so is the case. It is hard to recognize what this image is, but it is my camera. 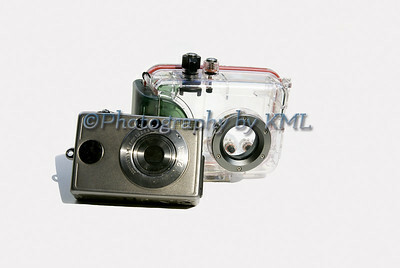 I have a small pocket digital camera that has a waterproof plastic case that is made for going underwater. It is really cool - all of the buttons on the case line up with the camera, so it is still completely usable. It says the case is made to go to 10 meters in depth - and that more than covers anywhere I will be going with it. I have seen too many interesting things while swimming, and with this little guy by my side, I can capture them. I checked on one for my DSLR, but it costs almost as much as the camera itself. I will stick with this one and enjoy it just as much! Okay, I know these few birds are not very impressive, but I wish I had brought my camera with me on a trip to town this past weekend. 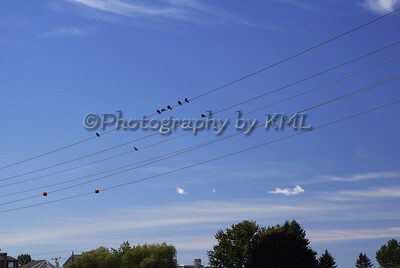 There are a bunch of power lines that span the river, and there are usually a good number of birds on them during a certain time of the day. But I had never seen anything like what was on there last time. All the lines were loaded, and they were all packed close together. That would have been a terrific photo. I am hoping they weren't just passing through and taking a break, as I will be on the lookout for them again. Hopefully I can snag a photo - it was a sight to see! 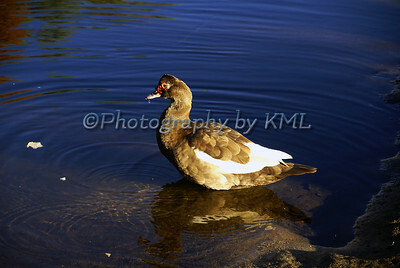 I have posted about this Muscovy Duck several times over the past couple of months. We went down to the lake earlier this week, and were very happy to see that she wasn't there. The lady who lives across the street from the lake had also commented that she hadn't seen her in a couple of days. We were all quite pleased that she had moved on. We stopped by yesterday after a couple of errands, and wouldn't you know, there she was with the two Mallard Ducks that had been staying with her the last couple of weeks. I saw some ice forming on the other side of the lake, and I hope they move on before it gets to this side. When you see these thunderclouds beginning to form in the summertime, you had better take heed. These ones were not very tall - sometimes these things can get really high! All fluffy and white on the top and dark and brooding on the bottom. Then the really dark ones start forming under these ones, and that's when you know you had better get inside. They are so beautiful though, as they usually come towards the late afternoon/early evening, and the sun is angled in the sky to give them the most gorgeous light. The biggest and prettiest one I have ever seen was just a couple of days before these ones, and wouldn't you know, I didn't have my camera. And I usually never leave home with out it - figures!